Dragon Door: How were you first introduced to kettlebells and bodyweight training? Fredrik Högström: I started ordinary strength training with a friend when I was about 15 years old. We looked up different forms of training on the internet, tried a little bit of strongman training, made some of our own equipment, and pushed cars. Soon I found the Dragon Door forum and Power to the People. The forum and book encouraged me to continue exploring beyond ordinary strength training. I found Power to the People soon after it was first published in 1999, and shortly before my military service in 2000. I thought the simple approach of just doing one deadlift and one press was very interesting. I experimented with it and because I was training for military service at the same time, I was also doing basic strength training, and walking with a heavy pack. Dragon Door: How do you balance running Kettlebell Center with your computer science degree and job? Fredrik Högström: When I met my wife in China, I was still studying computer science. When I came back to Sweden I started working as programmer full time. Soon after taking that job, I realized I wanted to do more physical training. Before that time, I was only training martial arts. I had studied kung fu for a long time, which was how I had ended up in China. I had been training kung fu at the Shaolin temple, really liked China, and so I went there to study and met my wife there too. 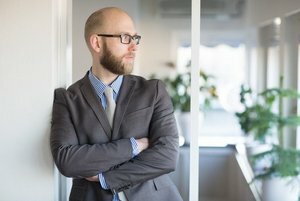 After working as a computer programmer full time for a year and a half in Sweden, I noticed that my fitness and physical abilities were decreasing. I didn’t have time to train, and decided that I didn't want to just have a desk job. So, I took a personal training course in Sweden so I could work as a personal trainer. At first, I tried to work as a trainer full time, but it wasn’t very popular in Sweden yet. People were just starting to use personal trainers, and I wasn’t making enough to survive so I found a part time job as a systems administrator. This was a perfect match because I could work with computers 40% of the time and also work as a personal trainer. This happened in 2007, and I was also considering how I could keep developing my own training. For many years I trained with the PTTP program, but right after I came back from China, I started training with kettlebells. There weren’t any kettlebells in Sweden yet, so I ordered one from Dragon Door and trained with it for about 1.5 years. I wanted to go to an RKC Workshop, and thought I also might like to sell kettlebells in Sweden. At the time, my wife and I were living in a small flat that I’d bought before going to college. I contacted Dragon Door and John Du Cane to see if it would be possible for me to import and sell kettlebells here in Sweden. After some talks with John Du Cane and Allison, we decided that I could try it. I sold my flat, and with the money bought one container of kettlebells in 2008. The container arrived in October, and I led a workshop about kettlebells to see how well they would sell. We sold the whole container of kettlebells and soon decided to become a distributor for Dragon Door kettlebells in Sweden. We started the Kettlebell Center company in 2008, and opened our gym in 2010. 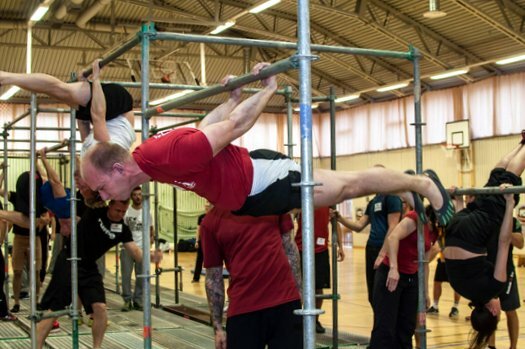 I went to the RKC workshop in Denmark in 2009, and afterwards held courses around the city by renting spaces in gyms, military facilities, and fire departments. I packed my car with kettlebells and went everywhere to teach. It was kind of a hassle, but renting gym space in the center of the city was expensive, so I put that plan on hold and kept teaching. One year later, when I started looking for a space again, our real estate agent found a space under a church in a less busy part of town. I decided to try it because my courses are always announced online. The space originally had 2 rooms, but after a few months of building up the space, we were able to have our kettlebell courses there. Dragon Door: What are some of the main benefits you've experienced with kettlebell training? Fredrik Högström: I've been through several stages of my life since I started to use kettlebells. When I started, I was still working at a desk job full time and had to do all of my training outside or at home. I also had my kettlebell at the office so I could do some GTG training combined it with bodyweight training—pistols and push-ups—to help me survive! When I started as a personal trainer, kettlebells were still my main training method. I followed the Rite of Passage program for almost two years which made me strong with the clean and press. The two things which have contributed to where I am now—Chinese martial arts to build flexibility and strength and the Rite of Passage program. Even if I don't train the clean and press for several months, I keep the basic strength for pressing, and quickly regain the strength I had before. Dragon Door: How long have you been working with bodyweight exercises, and what is your favorite? Fredrik Högström: I bought the Naked Warrior and PTTP books at the same time. So when I had access to a barbell, I did barbell work, but when I lived in China I worked on one-arm push-ups and pistols exclusively. My favorite bodyweight exercise right now is the bridge, but my absolute favorite is still the pistol. Other favorites are the pull-up and push-up. Dragon Door: How did you decide to host a PCC Workshop? Fredrik Högström: When Convict Conditioning came out, I knew that there would be a certification workshop for it one day, so I wanted to host it from the start—even before it existed! I think the PCC is very different different than the RKC. 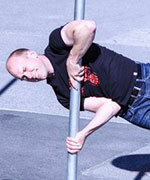 The RKC has a more narrow focus, but bodyweight training is for everybody. When I found out that the Kavadlo brothers would be the instructors, I knew I really wanted to host it. Dragon Door: What are your group classes like at Kettlebell Center? 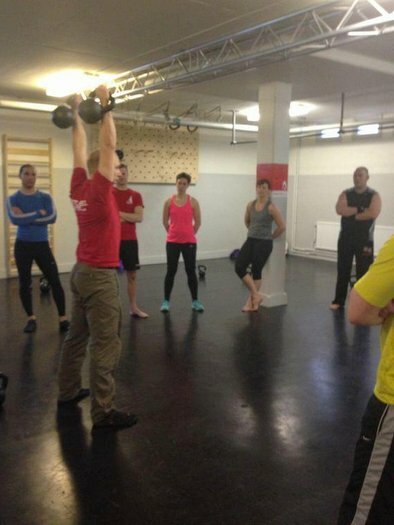 Fredrik Högström: I mainly teach the kettlebell courses and a bodyweight course, which are similar to the RKC and PCC, but for the average person. The kettlebell course is divided into an intro, level 1, and level 2. The three together cover the RKC Six. After the PCC, I came up with the bodyweight version of the course. We also have three RKC instructors who hold regular classes at the gym. I started Kettlebell Center with the goal of providing kettlebell training for everybody. At first, mainly martial arts guys attended the courses. But, whenever I talk about kettlebells, I show how kettlebells are for everyone—no matter what age, gender, or level of training experience. For the past two years our gym members have been a 50/50 mix of men and women. Now, we almost have more women attending the classes. Our classes are challenging, but we don’t just make them extra tough, everyone should feel better after they leave their session. We don’t advertise very much, and most people start training here because someone has told them about it. Our gym is different—it’s in a basement and rough around the edges but everyone is welcome. Most mainstream gyms have a lot "tough guys" posing in the mirrors and loud music, but Kettlebell Center is somewhere that everyone can be themselves and train. Our gym is simply an open space with a few tools for great training. Dragon Door: What goals are you working toward right now? 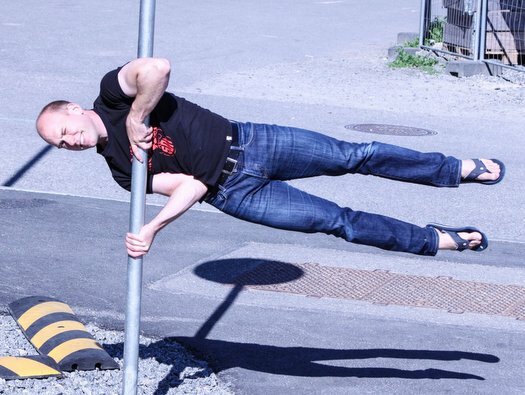 Fredrik Högström: This year, my number one goal is the human flag. Since PCC, my focus has been on bodyweight training. When Convict Conditioning first came out in 2010, for a few months I only did bodyweight training. I had been having problems with the inside of my elbow—golfer’s elbow—because I was preparing for the RKC II, a CrossFit competition, and a Swedish chin-up competition. But by training extra hard to increase my chin-up numbers, I enflamed my elbow and couldn’t even grip a kettlebell. This happened at the beginning of 2010—the RKC II Workshop was coming up soon, and I couldn’t do any kettlebell training at all. So, I did a lot of bodyweight movements that would help me make the half bodyweight press. It was around that time that I started to use Convict Conditioning. I’ve always wanted to do so many things—the human flag, handstands, half bodyweight presses, and a 400lb deadlift. But realized I was trying to do too much at once without accomplishing any of my goals. I was also working at both of my jobs, and very stressed. So, I decided to just start on the first step of every Convict Conditioning drill, and spend at least one month on those first steps—even if I made the progression standard early, I just kept working on it. I did this training for a little over a year and learned a lot from it. Most people skip ahead too soon, but even though I could already do stand-to-stand bridges, I had difficulties with some of the earlier steps. By mastering the earlier steps like the straight bridge—which taught me more about the tension in the hamstrings and glutes—my full bridge looked about 10 times better than before. I also didn’t have any more back pain. The bridge really opened me up because I started at the beginning, which improved the final product. I also learned that you can’t be the best at everything all the time. You have to focus on one thing and learn from it. The training sessions are fun, and you can feel each time that you’re improving and learning something. You don’t have to do the heaviest lift or toughest move to feel good about your training, and if you are always after a PR you will fail many times—most people do not get much energy from their training if they fail all the time. Sometimes people are afraid that by doing this kind of training they will lose their deadlift or press, but that doesn’t matter and it will always come back. Dragon Door: What's next for Kettlebell Center? Fredrik Högström: After talking with Max Shank at the RKC leadership meeting last summer in San Diego, I came back with many ideas from him and his gym. Previously at Kettlebell Center, we only had the courses and open training for people who attended the courses to practice with an instructor present. But after talking to Max, we started group training classes which have been very popular. Soon, we’ll be adding more classes—a kettlebell class, a bodyweight class, and a movement class. Dragon Door: What else makes you unique as a fitness professional? Dragon Door: How would you encourage an "ordinary person" to try kettlebell and bodyweight training? Fredrik Högström: I think people need to consider why they are training, and what they really want from their training. Usually people want to get better at a sport or try something fun. But most people also understand that good training will help them be better for their lives. I call it "life specific training" or sport specific training for having a better life. Going to a regular gym and sitting at a machine is not very good for improving someone’s life situation, especially if they are already spending 65-85% of their waking time sitting at a desk. Training should be something that helps us feel better in spite of the bad things we have to do in life, like sitting too much. In some ways, training should be a vacation from ordinary life.